Advocacy and Awareness: We coordinate affiliate involvement in maintaining and increasing the NC Housing Trust Fund. 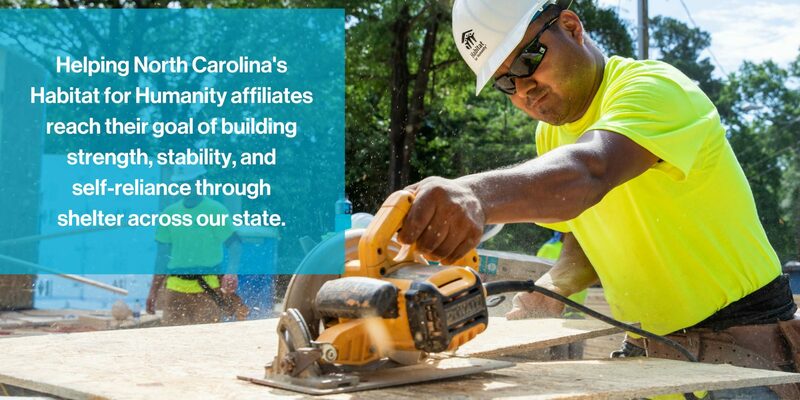 We promote actions at the state and local level to increase funds for Habitat’s home construction and infrastructure and raise awareness through education and training around the state. At the federal level, we work with HFHI on national and international issues of concern with regard to substandard housing, funding, and access to housing for lower income people. Resource and Partnership Development: With partners like the SECU Foundation, we enable increased housing production across NC. We seek to leverage existing affiliate mortgages to free up capital for new construction. We are focusing on finding partners who want to engage in third-party financing. Training and Professional Development: We encourage the adoption of best practices by all affiliates. We put together an annual conference for NC affiliates (Camp Habitat) that serves as the primary statewide networking and educational event of the year. We facilitate other trainings as needed both centrally and regionally. Promoting collaboration and consolidation of services: We hope to encourage and engender greater operational capacity and more homes for families in need by promoting consolidation to the point of merger. Coordination of Consulting Services: We consult when asked, or we arrange for professional consultants on a range of topics.